On Thursday, Nov. 1, an IPSP launch event will take place in New Delhi, India. 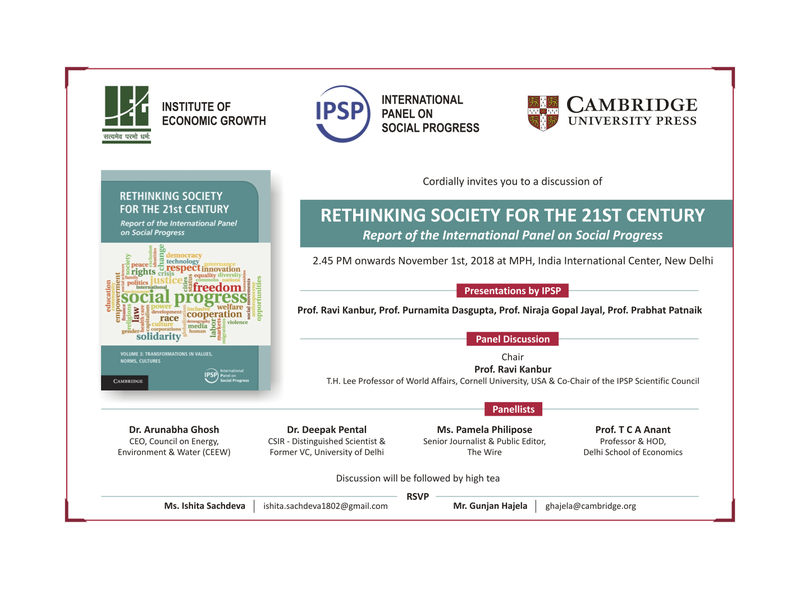 Hosted by the Institute of Economic Growth and Cambridge University Press, the event will include a presentation and panel discussion about the newly-published IPSP report. Several IPSP authors will present the report: Ravi Kanbur (Steering Committee), Purnamita Dasgupta (Coordinating Lead Author, Ch. 4), Niraja Jayal (Lead Author, Ch. 2), and Prabhat Patnaik (Coordinating Lead Author, Ch. 20). Ravi Kanbur will then chair a panel discussion with four highly distinguished authors and researchers: Arunabha Ghosh, Deepak Pental, Pamela Philipose, and T.C.A. Anant. The event will begin at 2:45 PM at the India International Centre. For more information, see the flyer below.